A set of 10 queen rearing cups, sockets and cages. 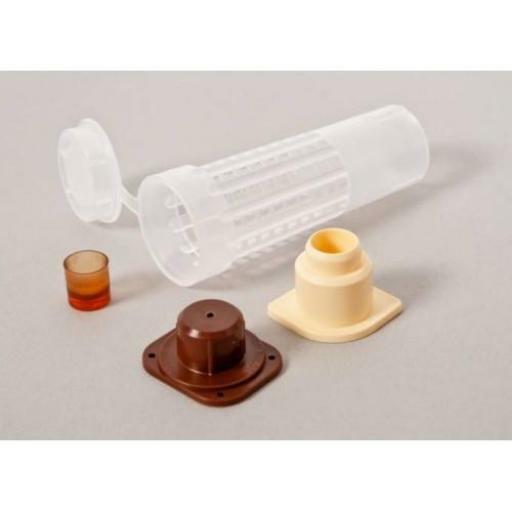 The dark brown spigot is pinned to the bar of the grafting frame and the cream coloured socket is pressed onto it. The brown cells cups are added, either with the young larva already in place if using our corpularva cassette system or the larva is grafted on afterwards. The cage is added towards the end of the queen rearing process, a few days before emergence. Cages are not essential but they prevent the bees tearing down the queen cells or if a queen emerges earlier than expected and kills the other queens. This usually happens when an older larva was grafted by mistake. 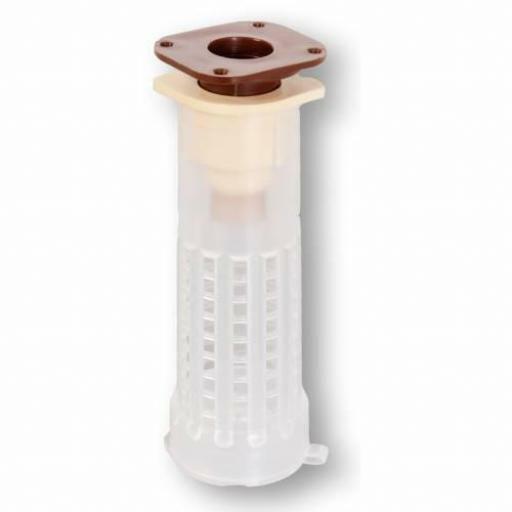 If the queen cell is to be introduced to a colony the cream coloured socket is gently removed from the brown spigot with a twisting motion and can then be placed between two frames in the new colony or mini-nuc. The cream coloured socket has small wings which support it on the top bars of the frames.